At Bob Oates Plumbing, Sewer, and Rooter we know the one thing that is sure to ruin your day, week, month, or even your year: a serious plumbing issue. Depending on the particular issue, you could be stuck with a problem that not only affects the value of your home, but also the state of your wallet. Luckily, many problems are actually preventable if you just make sure to maintain your drains both regularly and correctly. But, you’ve got to ask yourself, are you able to actually do that on your own? 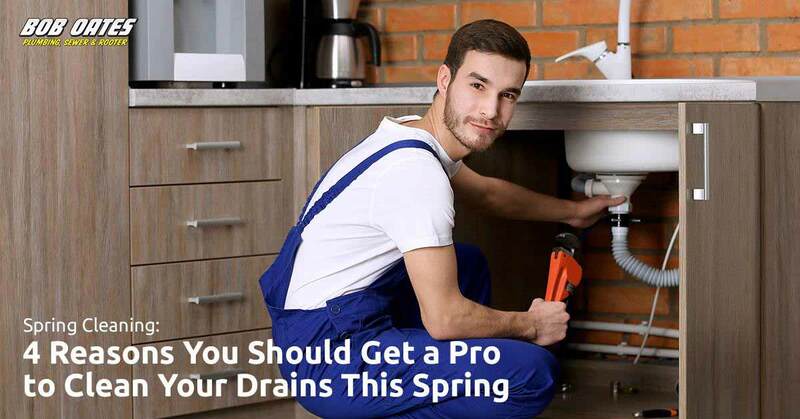 Well, that’s why it’s important to enlist the help of professionals who are experienced with sewer cleaning in Seattle, and there’s no better time to get it done than in Spring. Everyone has experienced a clog before. For many, the default response is to pour in some chemical drain cleaner and hope for the best. If this is your go-to clog strategy, don’t worry – no one at Bob Oates Plumbing Sewer and Rooter is going to judge you, but you should know that drain cleaners don’t always work, and sometimes they can actually cause more harm than good. Plus, in some instances, a recurring clog here and there can mean that there is a more serious underlying issue. As more time goes by, the problem will only get worse and you’ll have to hire a professional who does sewer cleaning in Seattle anyway. If the waste in your sewer lines builds up, flow will be affected, and you might see material coming back up. In this case, you will definitely need a professional to inspect your sewer system to find out the extent of the blockage so that it’s handled properly. It’s no surprise that there are many unpleasant consequences of a malfunctioning sewer system. The foremost of these, as we’ve already touched on, is when material starts to come back up. At Bob Oates Plumbing, Sewer, & Rooter we see it all the time, and we’re used to it, but for some of our customers it can be a bit of shock! In a less serious situation you may smell foul odors coming from your drains. In either case, you should consider calling a professional sewer cleaning company before conditions deteriorate. You might not be able to contain the waste that has decided to make its way back into your home. A toilet that overflows every time you flush, or a basement that becomes flooded with sewage can create an unsanitary and unsafe environment, but you can easily avoid these situations with regular sewer cleaning and maintenance. “Contaminated” is a bit of a strong word, but at Bob Oates Plumbing, Sewer, and Rooter we’ve have had to break the bad news to clients before. If you have a drain that isn’t doing its job, there’s a chance that your water may become contaminated. In some cases, the waste that is filled with bacteria and other gross substances can start to affect various water sources in your house. This might be the foremost reason you should call a professional sewer cleaner. Rather than being an inconvenience or just being gross, contaminated water can present some pretty serious health hazards. It’s not worth it to try and change it; if you suspect you’re having drain issues, it’s time to call Bob Oates Plumbing, Sewer, and Rooter. It’s true that some home projects can be handled on a DIY basis. But aside from unclogging your toilet and cleaning out your garbage disposal, a plumbing or sewer issue is not one of them. Given the possible consequences of a dysfunctional drain, you’ll want to make sure the job is done quickly and correctly. Often times, the job will require the latest technology and an experienced technician who knows how to use it. Without this kind of expertise, you’re basically taking a trial and error approach, and you can do a lot more harm than good, causing substantial damage to your home and pocketbook. If you’re looking for a skilled plumber who specializes in sewer cleaning in Seattle, we’ve got you covered. With Bob Oates Plumbing, Sewer, and Rooter you’re getting only licensed, qualified and vetted plumbers. As a result, we have built a reputation with Seattleites as the foremost plumbing service in the city. We are available every day, all day, and we understand how important it is to have someone you can count on when you have a drain emergency that requires immediate attention. We’re fully equipped and ready to take on your plumbing issues! If you want to find out more about our sewer cleaning in Seattle, contact us today!